Zoë will be a special guest at the Royal College of Paediatrics and Child Health’s Christmas celebration on 12 December. She’ll give a reading described as the ‘centrepiece’ of the event at London’s Priory Church of the Order of St John. Reserve your place at the RCPCH Christmas Celebration on 12 December where @ZoeWanamaker will be making an appearance along with other special guests. Tickets are available now. Everyone is welcome. Zoë is also due to attend two or three other festive charity events. I’ll aim to bring you more details if and when her involvement is publicly announced by the charities. It’s no secret that Zoë and her husband, Gawn Grainger, love theatre – they’ve recently been photographed at two press nights in London’s theatrical heartland. First they attended the opening of Don Quixote, the RSC's stage adaptation of Cervantes’ entertaining classic, at The Garrick on 8 November. Gawn talks about the play, alongside other special guests, in this press night video. Next came the opening of Tennessee Williams’ compelling Summer and Smoke at the Duke of York’s on the 20th. Zoë and Henry Goodman are the narrators of an important new documentary, Forgotten Solider. It uncovers unsung hero Sally Noach’s efforts to save hundreds of Jews during the Second World War. You can hear Zoë’s narration in the documentary’s trailer. Forgotten Solider was broadcast at Noordelijk Film Festival in Friesland, Netherlands, on 11 November and the UK Jewish Film Festival in London on the 19th. You can keep track of future screenings on the documentary’s website. Zoë is among a starry roll call of performers paying tribute to servicemen and women in the video for charity single ‘The Hero – A West End & Friends Tribute’. The song, written by prominent composers and lyricists Daniel and Laura Curtis, is raising money for Help for Heroes. ‘The Hero’ is available to buy from all digital music stores. You can also donate to the fundraising campaign’s JustGiving page. On 18 November, Zoë and other special guests attended the presentation of the Royal Theatrical Support Trust’s Sir Peter Hall Director Award to Nancy Medina. The ceremony took place in the Swan restaurant at London’s Shakespeare’s Globe. The Stage has a photo of Zoë with Medina and Ian McKellen at the event. Scroll to the bottom of the newspaper’s latest ‘In Pictures’ feature to find it. 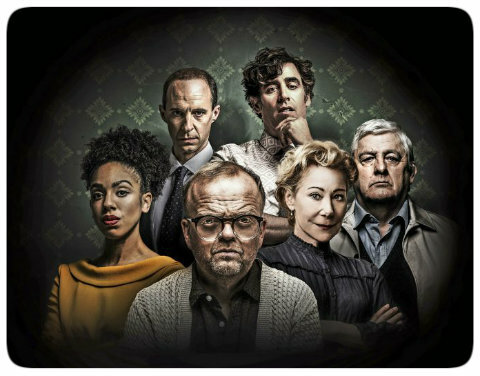 You can nominate your favourite recent UK theatre productions, as well as actors and behind-the-scenes crew, in the Whatsonstage.com Awards until 30 November. Might The Birthday Party, Zoë’s most recent stage hit, be among your choices?! An extended trailer has been released for Captcha, the 2014, steampunk-inspired short film featuring Zoë’s vocal talents. You can watch the full film via Film4. Captcha is distinctive and memorable – it’s good to realise that it’s still being talked about several years after its initial release. Zoë is among a large number of female public figures who’ve joined human rights charity Amnesty International’s call for the UK Prime Minister, Theresa May, to support the decriminalisation of abortion in Northern Ireland. In anticipation of the issue being raised in Parliament today, Zoë and the other women involved in the campaign have signed an open letter to the PM. ‘Women in the UK shouldn’t have their rights denied simply because of the region they live in,’ emphasises the letter. ‘An affront to women in Northern Ireland hurts us all,’ it adds. More than 50,000 members of the public have signed a petition, also organised by Amnesty International, with the same aim. And finally, did you spot Zoë’s delightful artwork in the Heart Research UK’s Anonymous heART Project auctions recently? Here's a video of the Pages of the Sea project in action. Thousands gathered on beaches around the UK today to pay their respects to the millions affected by World War One, which ended exactly 100 years ago. Zoë's powerful reading of 'The Wound in Time', the poem specially written by Poet Laureate Carol Ann Duffy to mark the centenary, accompanies some of the footage. Can you spot Zoë’s art in Heart Research UK’s charity auctions? Can you tell your Meaden from your Wanamaker? Heart Research UK’s fundraising auctions, collectively known as The Anonymous heART Project, feature over 400 impressive, postcard-sized artworks by artists, actors and other supporters of the charity. The artwork auctions are currently taking place on eBay. One of the items for sale was created by Zoë – can you guess which one? You have until 9pm (UK time) today, 11 November, to bid. Happy Halloween to Zoë's fans! Wishing all of Zoë's fans a spooktacular Halloween with the aid of Agatha Christie's frighteningly good sleuthing duo, crime writer Ariadne Oliver and private detective Hercule Poirot! 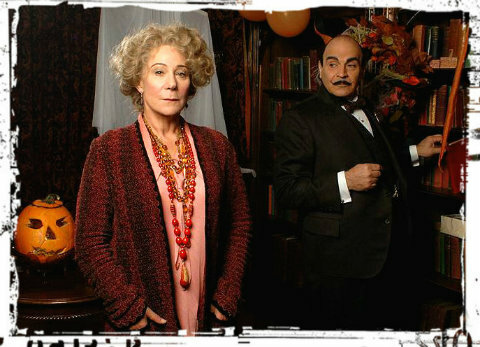 The pair are pictured in 2010's seasonal Poirot episode, 'Halloween Party'.